Well, now, 2017 was a real corker, wasn’t it? I don’t know about you, but I for one am glad it’s over. I suggest that we take up, once again, Hope as our point of view for 2018. Keeping a good thought leads to good results. And if there’s only one oil you buy from Rev. Dee’s Apothecary this year, buy our Louisiana-style Van Van Oil and buy it now! Below you’ll find a list with explanations of all the uses of Van Van oil, but first, a little history. Most of the Van Van oil you buy in stores is just synthetic lemongrass oil in a synthetic carrier oil such as mineral oil (a petroleum byproduct.) Some of it doesn’t even smell lemony, so who knows what’s in there! Originally, Van Van oil was the name of an oil made from lemon verbena, called verveine in French and pronounced “van van” or something similar in Louisiana French dialects. So the original ingredient wasn’t lemongrass at all, it was lemon verbena. Lemon verbena (verveine) is not the same as the herb that we call vervain in English, which does not have a lemony taste or aroma. Verveine is a popular herbal tea (tisane) in France and is easy to find in the U.S.
For those who are unfamiliar with Louisiana traditions, let me explain that we’re talking about New Orleans tradition but also traditions outside of the city such as those in Cajun Country. Many cultures put their stamp on Van Van oil in the state of Louisiana so that is why I labeled my product as such, since Louisiana-style Van Van oil is far more complex than most other styles of the product. It contains several lemony, all-natural essential oils such as lemon verbena, lemongrass, lemon, melissa (lemon balm), citronella, and a special zing from a bit of ginger oil. The herb you find floating in it is a bit of finely chopped lemongrass. I’m making new Van Van (see the picture of my worktable) for 2018 so get it while it’s fresh! It is the most versatile oil you can buy. Floor wash water: Use several drops in a bucket of floor wash; pine scented or lemon scented is recommended. Use this floor wash both at home and in your business; we recommend the ¼ or ½ oz. size instead of the usual 1/8 oz. if you have a lot of floor space to wash.
Furniture polish: Most furniture polish is lemon-scented anyway; if using spray-can polish, just add a couple of drops to your polishing cloth or paper towel along with the polish. If using a bottled oil, you can put the Van Van oil directing in the container; in this case, it’s best to buy the larger size. Spray cleaner: if you use a lemon-scented spray cleaner for counters and windows, go ahead and add the drops to the container if it opens or add a couple drops to your paper towels as you clean. Work area cleaner: If you have a desk, office, or cubicle, I suggest not only cleaning your desk but also around doors and windows. This is also protecting the area; more on that in a bit. Your business: If you own your own business, clean all display cases as well as floors and windows as above. See below for protection advice. Cleansing yourself: If you bathe after you come home from work or school, remove any negativity you may have absorbed during the day by anointing yourself with Van Van oil while you bathe or shower. Anointing the throat chakra is optimal; some also anoint forehead and crown of head. Don’t get Van Van oil on mucous membranes; the ginger and lemon in it can irritate sensitive skin. Cleansing candles: If you work with candles and they get dusty before you use them, you can cleanse them with a soft cloth or paper towel and a little Van Van oil. Workplace and business protection: After cleaning all appropriate surfaces in your business or workplace, clean around the door frame/window frame of your office or cubicle; if you own your own business, it’s important to protect it, so any possible entryways should be cleaned and anointed with Van Van oil. If you wish, you can say whatever protection prayer or chant you like while you are cleaning and anointing; that part is up to you. I always clean the desks in the office I share at college and clean/anoint the door frame. Teachers and professors can’t be too careful these days! When someone walks by and asks what I’m doing, I usually say, “My New Orleans stuff,” and they say “Oh,” and keep on walking! If you are worried about people you share the room with having allergies, just use enough water to remove the scent after you cleanse/anoint. Don’t worry; the vibes will still be there! Protecting yourself: If you bathe before work or school, anoint your throat chakra while you are in the bath or shower. It’s ok to rinse it if you’re worried about the scent, but believe me, most people find the aroma divine! Saying a prayer or mantra of your choice is a good idea while you’re doing this. The Van Van oil acts like a barrier to keep out other peoples’ negativity. If you must go to work or school in a dangerous part of town, make sure you anoint yourself before leaving home. Anointing candles: Spell candles or religious candles can be anointed; Van Van helps with all positive intentions. It can also be used in addition to other oils. 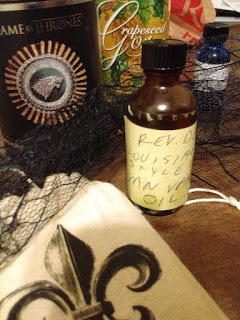 Anointing gris-gris, mojo bags, etc. : Van Van oil is great to anoint and re-anoint your mojos and gris-gris, especially those for gambling and for love. Lucky charms can be anointed as well. Spell and spiritual work: Van Van oil is used as a primary oil in spiritual cleansing, blessing, and protection, and can be used in limpias, also known as house cleansings/blessings. In spellwork it can help to purify, cleanse, protect, add power or luck. It can be used in conjunction with other oils and dressings as a counterpart to another oil that is used for positive purposes. Our Louisiana-style Van Van oil comes in 1/8, ¼, and ½ ounce bottles. See Rev. Dee’s Apothecary at www.DyanaAset.com or our Facebook page at https://www.facebook.com/RevDeesApothecary/ to order. To end with our message of hope, let me share with you a wonderful poem by Emily Dickinson.